Digital Science, a technology company that combines world-class technology with a resolute focus on research and those who support the research process, will adopt the National Institutes of Health (NIH) new article level metric of scientific influence - the Relative Citation Ratio, (RCR). The US biomedical funding agency has introduced the new metric to evaluate funded medical and academic research, to provide an improved indicator on the relative citation strength of a given paper, field-normalised and benchmarked against its peers. ÜberResearch, a portfolio company of Digital Science, has been analyzing the use of the newly generated metric and, following an overwhelmingly positive response from client testing, will begin to make these data available to a much larger constituency in the academic research, publishing, and science funding communities via Digital Science’s portfolio companies from July 2016. Symplectic, a provider of world-leading research information management software and services, plans to make RCR available to 37% of the members of the American Association of Universities and over 80 leading research centers around the globe, via its flagship product, Elements. 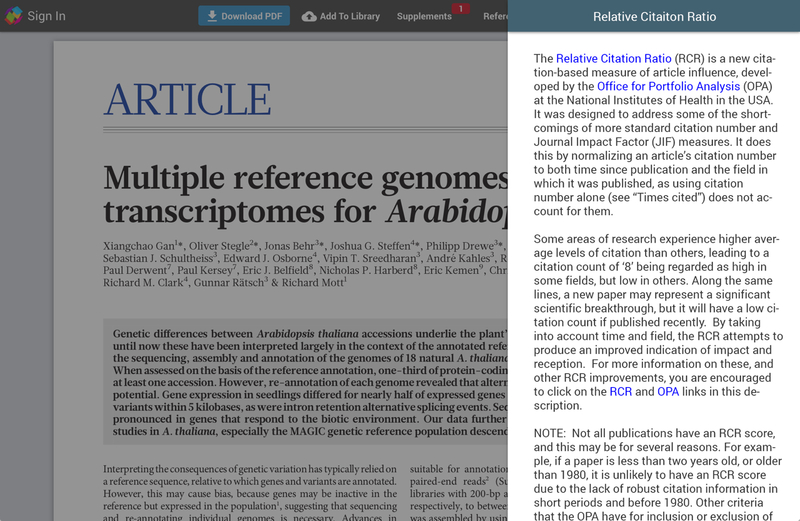 ReadCube, an innovative software developer serving researchers, publishers, academic and commercial organisations has added RCR statistics into its reader environment - touching over 15M unique researchers a year from 75+ partners including global academic publishers and educational institutions. Figshare, an online digital repository to help academic institutions manage, disseminate and measure the public attention of all their research outputs whilst helping them meet key funder recommendations. Figshare provides world-leading tools to support an open culture of data sharing and collaboration. ÜberResearch’s Dimensions platform with more than 200 funders and over $1 trillion in historical grant awards integrated has been updated with RCR in the corresponding publication data. 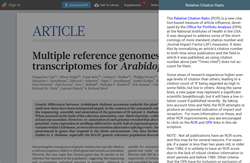 This change will have particular improvement to Reviewer Identification tools, which will now include RCR scores in the over 3M disambiguated author profiles available in Dimensions. Altmetric*1, the alternative metrics company, which tracks and analyzes the online activity around scholarly literature, serving some of the world’s biggest publishers, funders and institutions around the world. ÜberResearch is a global business with main offices in Cologne, Germany; London, United Kingdom; Washington DC & Columbia, USA and other European and US locations. For more information, visit: http://www.uberresearch.com and follow @uberresearch on Twitter.